Obliterum is an item you can get at max level. It is used to increase the power level of your crafted armor (not Relics according to wowdev but it worked on beta and will probably be changed). So if you have crafted an armor with an ilvl of 850 and then apply Obliterum on that, it becomes 885. 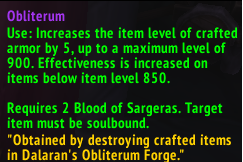 You can increase the crafted item with Obliterum with 5 ilvl every time you apply it. Maximum ilvl on upgrading your crafted ilvl with Obliterum is 900, meaning that you can apply Obliterum on a crafted armor 10 times. The production and application of Obliterum cost Blood of Sargeras. How do I get Obliterum? You get Obliterum by destroying crafted Legion items (not only gear, so for example Relics, flasks, enchants etc works as well). You can Obliterate any crafted item. The material to craft an item sets the amount of how many Obliterum Ash you get when you Obliterate it. Gear that are cheap to make gives around 20> Obliterum Ash whereas gear that are expensive to make gives around 100 Obliterum Ash. And to make one Obliterum, you need 100 Obliterum Ashes. One Obliterum increase the item level of a crafted armor by 5, up to a maximum of 900 in patch 7.2.5. How do I get an Obliterum Forge? To be able to destroy crafted Legion gear you need to have access to an Obliterum Forge. This quest is located in Dalaran in district Magus Commerce Exchange in which you have to put off a fire on a wagon. You have to find out who caused the fire. Starts and finishes in Dalaran and goes pretty fast. Speak to Oxana Demonslay in the Underbelly who knows how to build one. You earn sightless Eyes in Dalaran Sewers (Underbelly) which is a PvP area. There is a quest in the Sewers of Dalaran that rewards 150 Sightless eyes. For those that only want the eyes for the Obliterum quest line suggest to do this one only. The quest is called “Experimental Potion: Test Subjects Needed”. 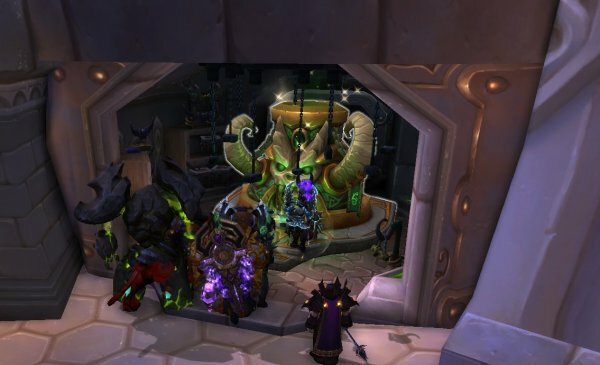 In the sewers of Dalaran, there are several Elite mobs that spawns from time to time. Killing them and looting gives you 50-90 Sightless Eyes. There are a number of chests in the sewers of Dalaran that you can loot and gives you 10, 40 or 100 Sightless eyes. However, the chests are for all and you probably have to fight for it (remember to be flagged for free for all combat). Obtain 20 vials of Spellsludge. Can be found on the powerful Underbelly creatures that appear while the Dalaran Sewer Guards are on duty. 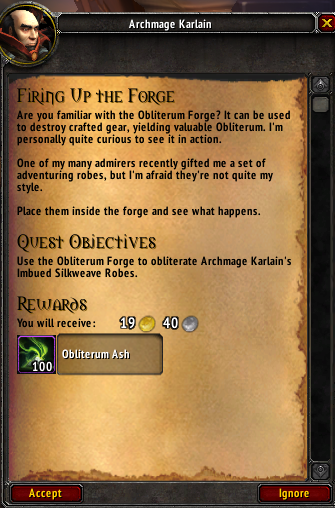 Once you completed this questline you will have access to the Obliterum Forge. 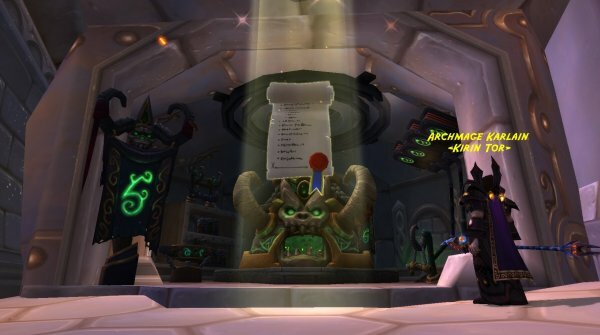 In patch 7.2, the pre-quests are removed for making an Obliterum Forge. Travel to Dalaran in The Violet Citadel. 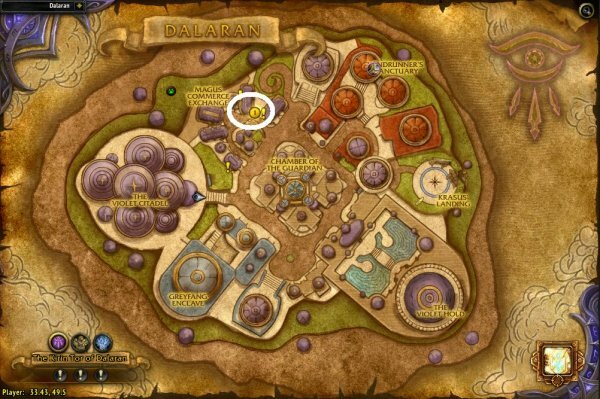 Travel to Magus Commerce Exchange area in Dalaran (see map below). Place the Item you got from the quest (Archmage Karalins Imbued Silkweave Robe) and obliterate it. Completing this quest will reward you 100 Obliterum Ashes which are used to make one Obliterum. One Obliterum upgrades 5 ilvls of a crafted armor. FOr more information regarding Obliterum see my guide here.